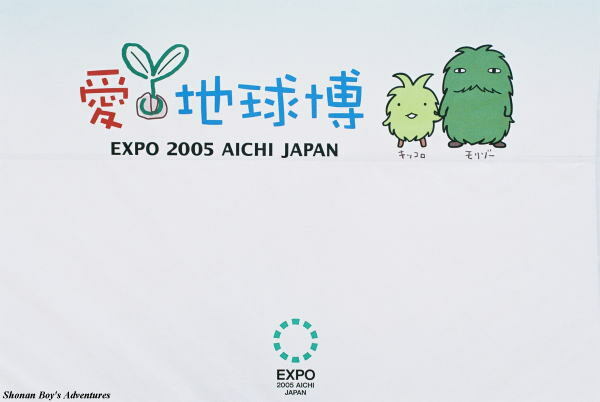 Memories of "EXPO 2005 Aichi, Japan"
The logo "EXPO 2005 Aichi, Japan" written on the information board at West gate. Most of photos are external appearance of building because taking photo inside was not allowed at most of the pavilions. This page is only for memories. 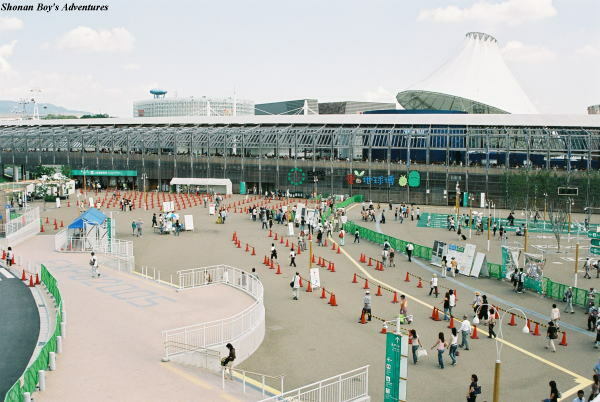 For more information about EXPO site, please see some books or official website. 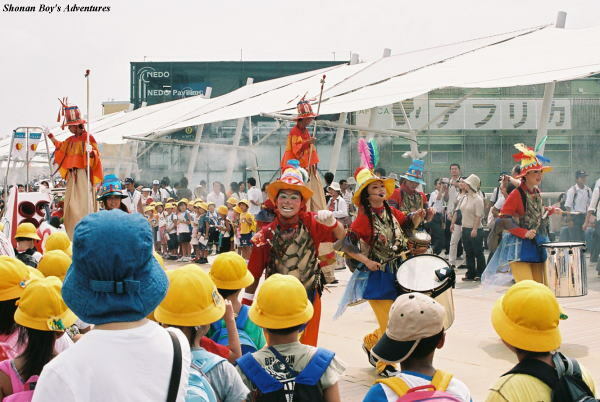 This website has nothing to do with the "Japan Association for the 2005 World Exposition." 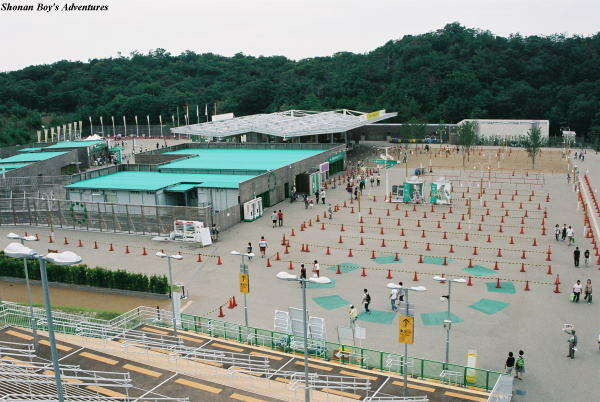 EXPO site consisted of "Nagakute Area" (about 158 hectares) & "Seto Area" (about 15ha). The shorterned word of "Morizo & Kiccoro" means "Moricoro". 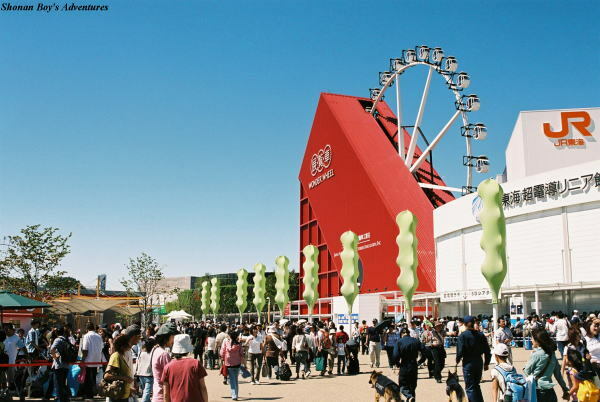 The Nagakute Area of Ex-"EXPO 2005 Aichi, Japan" will be open as "Moricoro Park (Ai-chikyuhaku Kinen Koen). 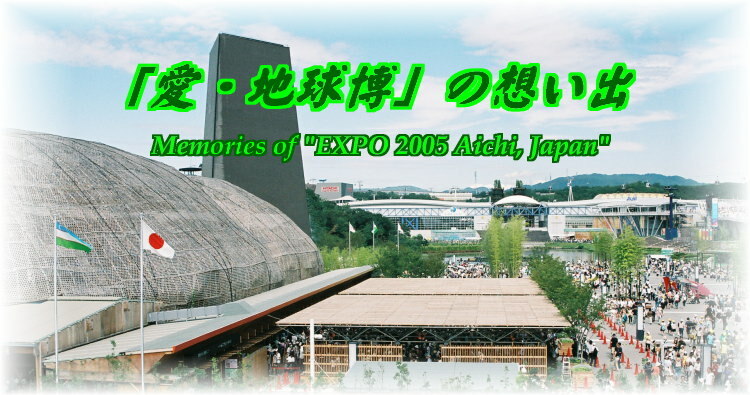 "EXPO 2005 Aichi, Japan" means "Ai-chikyuhaku" in Japanese. 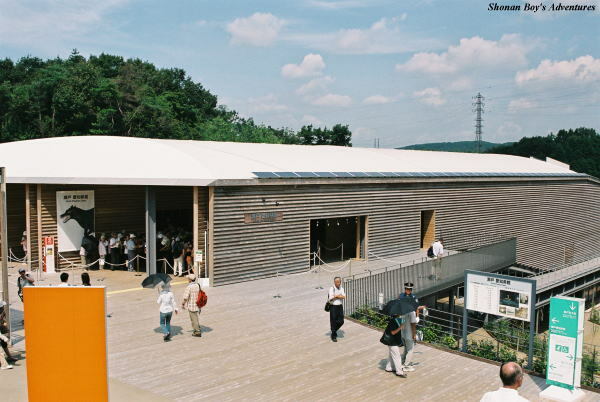 Literally speaking, "Ai-chikyuhaku" means "Love Earth EXPO", the environment exhibition. but "Nagakute town, Seto city, and Toyota city"　(Nagoya Eastern Hills), Aichi prefecture, Japan. 1 "North Gate"----- Ticket booths are on the left. An adult general admision ticket cost 4600 Japanese yen (one entry). An "Unlimited-use entry pass" cost 17500 yen (multiple entries), and it needed to paste a visitor's photo on ticket. If an adult visitor had entered 4 times or over, he or she got value for his or her money. One visitor had entered everyday. One visitor for youth pass had entered 270 times! Admission tickets contained IC chips. 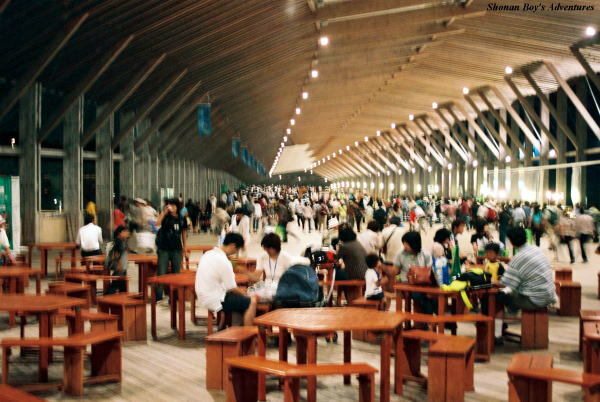 A visitor could make a reservation of pavilion with a ticket in advance. Visitors could also make same-day reservations for events right on the site (not all the pavilions). 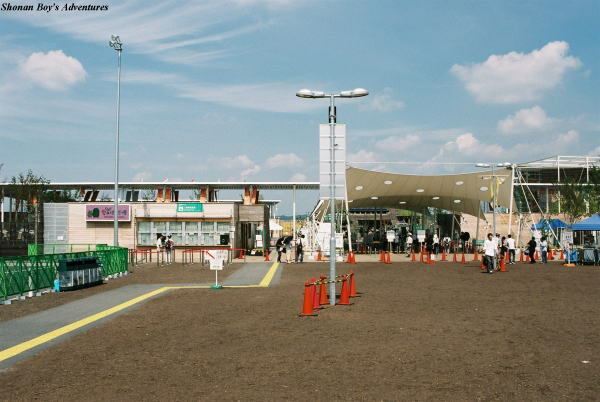 2 "North Gate" ----- The North Gate was situated in front of ex-"Bampaku Kaijo (EXPO Site)" station (the present "Ai-chikyuhaku Kinen Koen" station) of Linimo line. It was the most crowded gate. 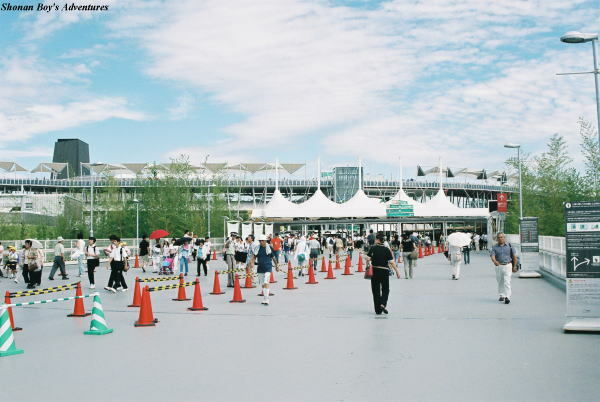 At the each gate, attendants distributed lost child seal. Parents wrote their cellular phone numbers. So it was the short time to find lost children. As aged visitors did not have it, it was difficult to find aged visitors. 3 A street closed to North Gate. It led to pavilions from East Gate via North Gate. Gondlas upper part of photo was "Morizo Gondola" linked Nagakute Area with Seto Area. Liquid-crystal windows of them cut off the residential district (about 2 minutes) because of residents' privacy. 4 Level 2 of North Gate. Many people eat food here. There were souvenir shops on the level 1. As Moricoro goods and other souvenirs were so popular that customers had waited for over 1 hour depending on the time. 5 "West Gate" ----- Visitors who used "Park & Ride" and disabled visitors entered here. 7 "Care Center" ----- Though this photo is East Gate, there was "Care Center" at each gate. Disabled visitors entered from it. 8 "Seto Gate" ----- Visitors who went to Seto Area entered here. Pavement in front of Seto Gate was Nature-friendly wood-chip. When visitors went to Nagakute Area, they rode the "Morizo Gondora" or "FCHV (the fuel cell hybrid bus). Top speed of FCHV was 80km/h. It was silent. 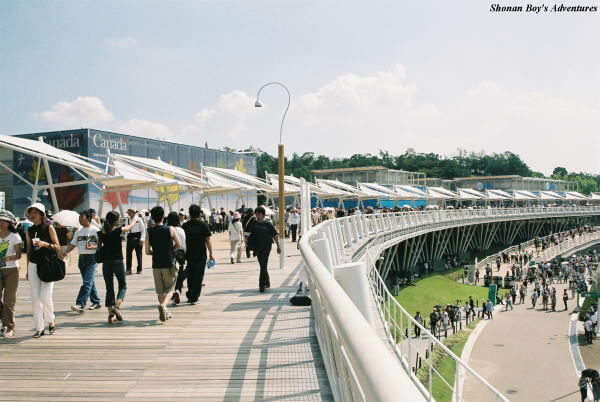 1 left: "Corporate Pavilion Zone A", center: "North Gate", right: "Corporate Pavilion Zone B" ----- The "Global Loop" was 2600 meters long elliptical route. 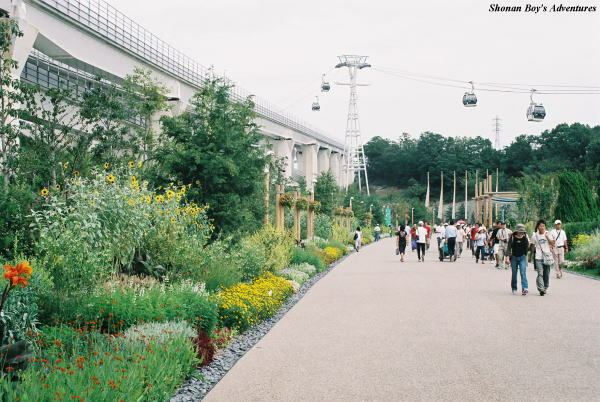 Lumbers of forest thinning was used for floor of Global Loop, and it contributed forest growth. It was nature-friendly. Visitors could see the whole Nagakute Area here. 2 "Global Common 2 (The Americas)" The dry mist had jet out from roof of Global Loop, when it was very hot. As a result of it, it was about 4 degrees Centigrate cooler around dry mist. It is low cost air-conditoner?!! 3 The parade by "Sol Ban Ban". They appeared everyday. Many kinds of organization appeared on the Global Loop. 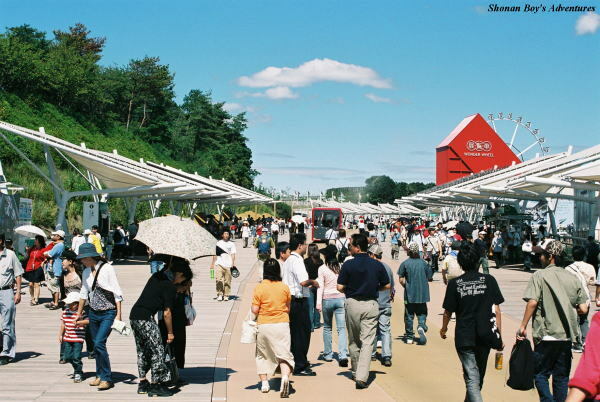 Visitors enjoyed everywhere in the EXPO site. 4 Global Loop between Global Common 5 and 6. 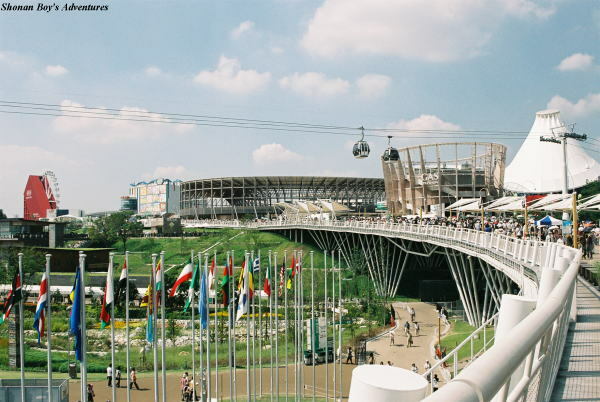 A "Global Tram" in the center of photo ran clockwise on the Global Loop. Trams and rickshaws ran on it slowly, it was environmentally friendly. 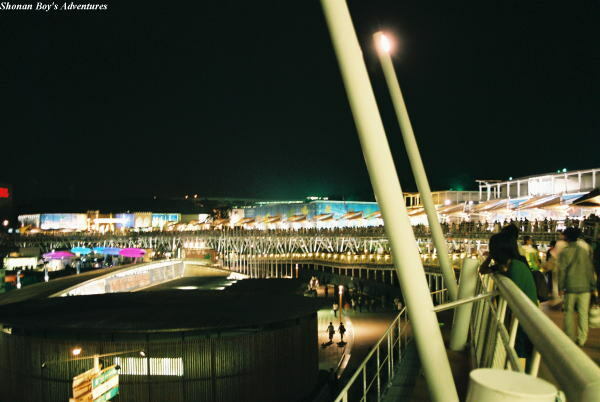 5 This scene is enjoying walking on the Global Loop, seeing night view of Global Common 1 and 2. 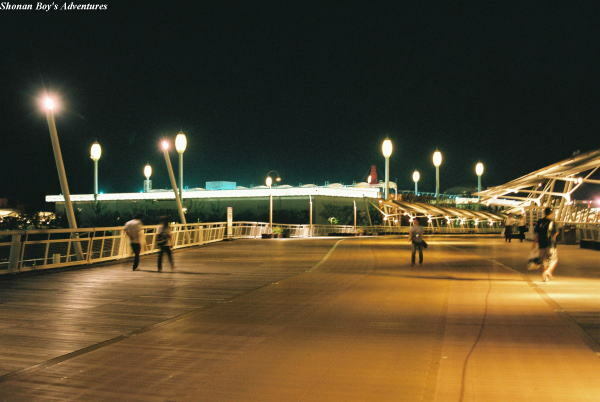 Night scene of EXPO site was also beautiful! Some people proposed to marry, seeing it! 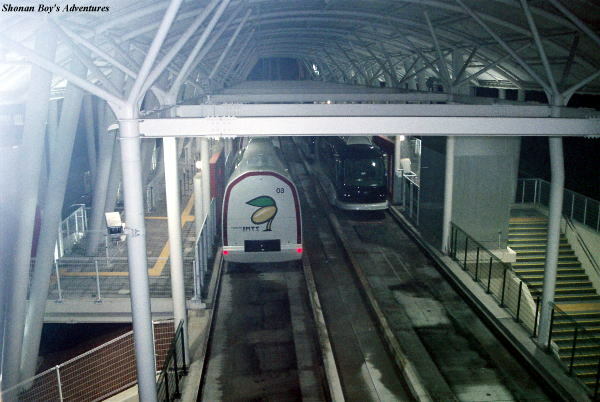 6 The night view of "Global Loop" and "Global Common 3 (Europe)", seen near West Gate. Robots cleaned floors and collected the trush in late-night hours after closure. Visitors separated rubbish into 9 kinds items. They say it was difficult to understand the reason for foreiners. 1 From right in turn, "JR Central Pavilion: Invitation to the Ultimate Surface Transit System", "JAMA Wonder Wheel Pavilion", "Mitsubishi Pavilion@earth." Visitors enjoyed a movie in building, and the view of site outside. 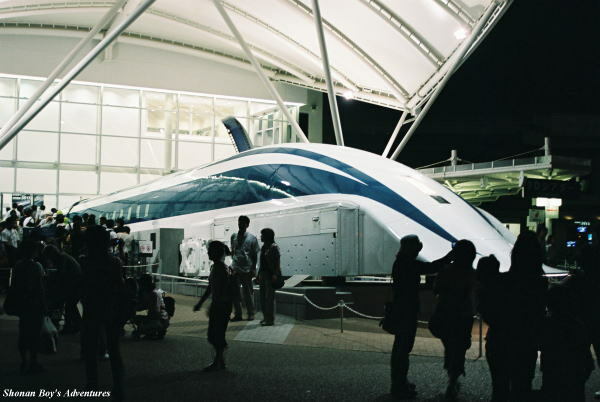 2-3 "JR Central Pavilion: Invitation to the Ultimate Surface Transit System" ----- A maglev car was exhibited, that run on the test line at the speed of 581km/h. 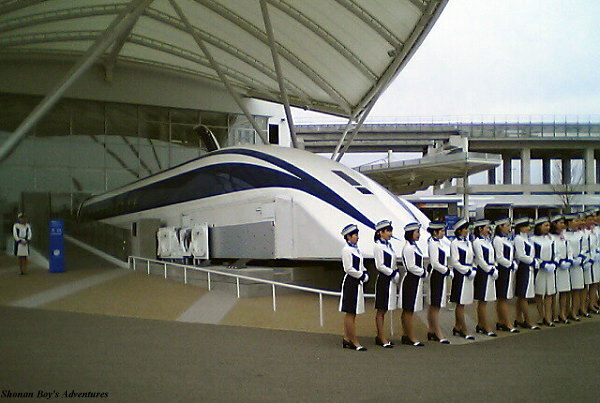 Visitors could see 3D movie of test run. 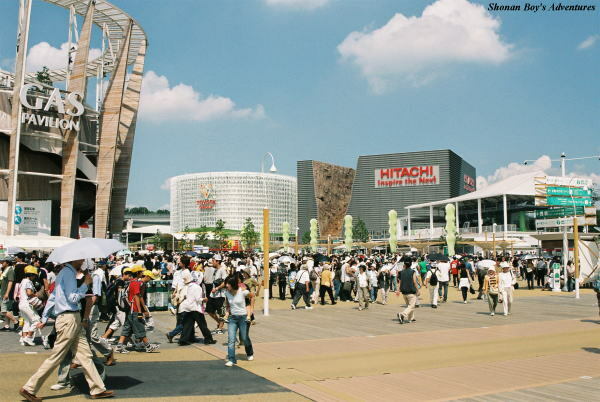 1 From left in turn, "Gas Pavilion", "Toyota Group Pavilion", "Nature Contact - Hitachi Group Pavilion's Ubiquitous Entertainment Ride", "Kiccoro Gondola North station". It was the most popular zone. 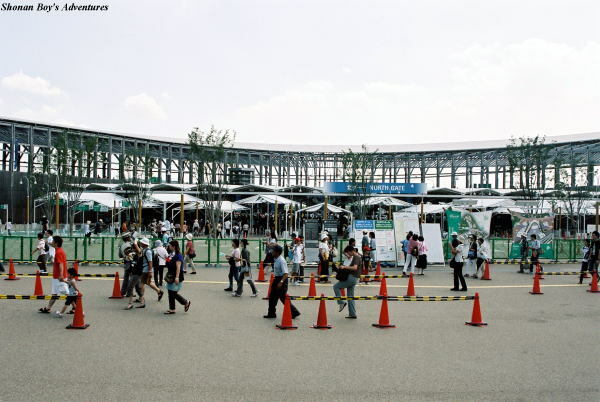 As soon as gates opened in the morning, many visitors rush to Corporate Pavilion Zone B (not allowed to run in site).